Logic+Emotion: Is Your Social Business Prepared? Readiness Levels Vary Amongst Organizations. Is Your Social Business Prepared? Readiness Levels Vary Amongst Organizations. Finding: Baseline governance and reinforcement enables employees to professionally participate. "Of the 144 companies we surveyed, all 18 Advanced companies allow rank-and-file employees to use social media professionally (Figure 1.2). However, Advanced companies also educate and provide guardrails so that employees know how to participate in a safe and consistent manner." If you consider your organization to be advanced in leveraging social media for business but have not provided education, guidelines or rules of engagement for your employees, then you may not be as advanced as you think. Guidance for a broader employee base can come in the form of training, or establishing recommended rules of engagement and of course a policy. These are only some of the basics and serve different purposes. 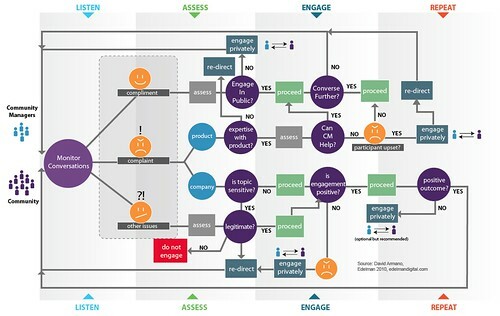 For example, the rules of engagement scenario map (below) outlines recommended actions against specific scenarios and is not the same thing as an enterprise wide policy. Organizations with less experience in scaling social are likely following a more ad hoc approach. Finding: Enterprise-wide response processes provide rapid customer engagement. "Companies are struggling to keep up with a growing volume of conversations – we found that enterprise-class corporations already average 178 corporate-owned social media accounts. As workflow across the enterprise becomes more complicated, consistency and efficiency decrease, while risks increase." Finding: A dedicated and shared central hub, often named the “Center of Excellence,” provides leadership. "Increased consumer adoption and low technological barriers encourage corporate stakeholders to deploy social media on their own, with or without formal approval. 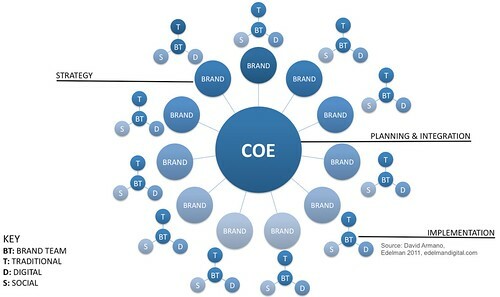 In our survey, we found that as many as 13 different business units across the enterprise engage in customer-facing social media efforts"
Increasingly, large organizations are adopting a coordinated approach to managing social efforts (Altimeter's report cites Adobe as an example, *Edelman client) however, COE's must be assembled with care. Personal experience working with organizations that implement a Center of Excellence highlights the tension between regional autonomy and corporate desire for more consistency. A "COE" must be carefully planned and attached to the right committees and regional representatives in order for them to reach their full potential. Altimeter's report does an excellent job of highlighting a more macro trend—that social media is increasingly integrating into organizations and in the process presents numerous challenges and opportunities. It also highlights the fact that large organizations display a spectrum when it comes to levels of readiness The report goes on to highlight some of those specific challenges and opportunities in the area of crisis management. I highly recommend reviewing it in detail. (Note: Edelman Digital colleague Michael Brito was sourced in the study).